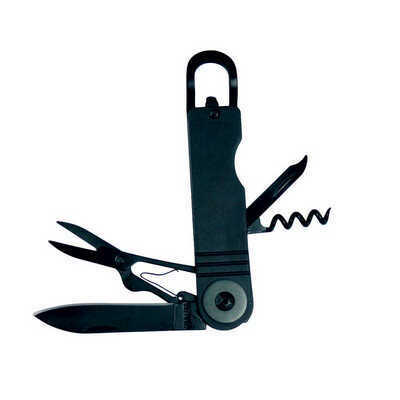 Description: Handy bottle opener and 4 function multi-tool. Features: Featuring a bottle-opener, knife, scissors, file and corkscrew. Packaging: Packed in a plastic bag and presented in a white tuck box. Packaging Size: 110mm(w) x 30mm(h) x 13mm(d) Colour: Black Material: Metal Plastic Product Size: 110mm(h) x 25mm(w) Freight details : 200 per carton, 18.5kgs, 24.5 x 18 x 34cms; Decoration Type(s): Colour Print / Full Colour Print / Laser Engrave / Print with Dome Decoration Area: Laser/Pad: 35mm(w) x 10mm(h). Price includes : 1 Colour 1 Position Print. Setup is included.